​Who can get benefit from the Commercial Food Dehydrators? ​Before proceeding further into the article, first of all, let's discuss that how many types of commercial food dehydrators are there in the market. ​There are generally 2 kinds of commercial food dehydrators which are obtainable in the market i.e. Electric Dehydrators as well as Solar Powered Dehydrators. ​Both of them possess diverse sources of energy but their function is just similar which is to eradicate the content of the water from the food items so that it can be preserved for longer time period. The elimination of water restrains the development of bacteria inside the food and stops it from getting decay. As you know that commercial food dehydrator is not much different from the normal dehydrator and in fact their functioning is also quite similar. ​The entire working of a commercial food dehydrator is quite simple. There are a timer and an automatic thermostat which let you alter the settings of the appliance according to your requirements. You just have to place the food uniformly over the trays and put them inside the dehydrators after getting assured that all the settings have been done accurately for the even heat distribution. ​The general constituent of these commercial food dehydrators consists of heating component, air ventilation, and cooling fans. All of these work together during the process of food dehydration. The heating component helps in heating the food so that excess moisture can be taken out. After this, the warm dampness is propelled away with the help of cooling fans. This entire process continues until the content of the water in food gets considerably lowered for the purpose of preservation. ​You must know that the drying temperature varies according to the category and quality of the food. For instance, more temperature is needed to convert the meat into jerky, whereas peaches could be dehydrated in lesser time as well as temperature. ​The optimum balance between air circulation, time and temperature is the only key for the perfect dehydration of the food in the commercial food dehydrator. 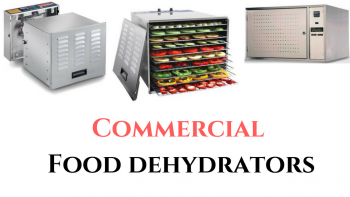 ​You must be wondering that what type of people should use these commercial food dehydrators. ​Well, the answer is simple. Any person who wants to dry out the food regularly and also in bulk quantities may use the commercial food dehydrators. 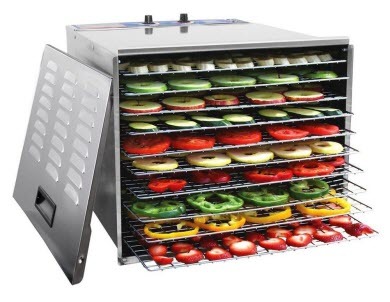 These food dehydrators have the larger capacity and it may consist of around 42 trays in some models. ​Some of them also even originate with a double zone model for drying out the 2 different kinds of foods rendering to their conflicting requirements. The capacity or the number of trays in such dehydrators can also be increased or decreased as per the need of the business. For example, a restaurateur can preserve the seasonal fruits, herbs, vegetables, and meat in bulk quantities through this way. ​Commercial food dehydrators are also a kind of blessing for the large size families who usually have to face the problem of lack of food abundance. They can dehydrate the ingredients of the food in advance so that the lavish meals can be prepared during any time. ​These appliances can also be perfect for the hunters who remain on the expedition for the longer time period. They can carry dehydrated food in bulk along with them so that their survival becomes easy in the worse conditions. ​Preserving the dried foods in large quantities also help the household ladies to save lots of money which they might have to spend in buying from the market. ​When you take a decision to purchase a food dehydrator, you have to decide several things in advance such as how large the appliance must be, and what will be the price which can be afforded. However, the commercial food dehydrators are available at different sizes and prices. ​The different types of brands of food dehydrators originate with dissimilar years of the warranty period i.e. from 1 year to 10 years. Actually, the different parts of the appliance brand may have separate warranties. Therefore, it will be very beneficial if you gather all the relevant information about them in advance from the manufacturer. The length of the warranty period also matters a lot. So, you should also check out this. ​Though we want that you never have to avail this warranty period service and your product works efficiently in the future. Nonetheless, when you are getting some benefits, it is always advisable to select the best option which is obtainable. ​The expenses which are levied on buying a commercial food dehydrator must be done with great care and thought by clearing your doubt over their worth and practicality. You should be assured that the brand whose product you are buying should possess a credible and a good status in the market. There are always few brands which may be popular but they have received bad reviews due to their poor after-sales service. Some of the brands which may offer costly products but provide quality customer service can be considered. ​One more thing which needs to be considered while buying a commercial food dehydrator is the amount of electricity which the appliance will consume. In a regular food dehydrator which is destined for the domestic use, 500 - 800 Watts of the power is sufficient. ​On the other hand, if you aim to use your appliance on a bigger scale, the high power appliance is required for the good dehydration procedure. ​After buying a commercial dehydrator, it is completely your personal choice that whether you want to stay gratified with it or wants to enhance your experience more. For getting additional innovative benefits of this appliance, you just have to do small extra investments for buying certain very cool accessories. Are you thinking that we are talking about the regular guidebook which comes with your commercial food dehydrator? ​No, here we are discussing the pioneering and auxiliary accessories that you can buy from the market for increasing the overall outcome of the food dehydration. ​Recipe books are easily available in the market by diverse commercial food dehydrator brands. These books state you the step-by-step guidelines not only related to the process of dehydration of different kinds of fruits and vegetables but also how you can make delicious recipes in very less time. ​Polyscreen Tray Inserts are made up of very flexible material that needs to be installed on the trays as you dry out your food. These accessories save the food items from getting stuck over the steel trays of the commercial food dehydrator. You may also make a roll of these trays for making a perfect fruit’s roll ups. This accessory basically benefits you in keeping your appliance clean from the dipping as well as sticking of the food. It can also be easily clean without any stress. ​There are numerous companies which have launched the vacuum bags and containers in the market which are prepared specially for storing the dried items. These accessories are available in diverse sizes. ​Vacuum bags can certainly be a more appropriate option than the normal plastic bags for the storage purposes because in vacuum containers the moisture does not get reabsorbed by the food and thus save it from getting spoiled. ​One more convenient way to dry out your food is in the pureed form. You just have to pour the entire liquid (for example yogurt) and leave for dehydration over the non-stick trays. These non-stick trays are manufactured from the silicon material. It can also be used for the baking purposes. The cleaning process of these accessories is also quite easy. ​Herb sniper scissors are one of the secondary accessories which help you in drying the herbs effortlessly by taking out the herb from its stems before placing them in the commercial food dehydrator. The herbs can be crumbled or sliced off when you are required to store them. ​This commercial food dehydrator comprises of adjustable thermostat feature along with the strong power capacity of 1200 watts. The range of adjustable thermostat is between 95 degrees F to 155 degrees F.
There is a horizontal airflow for providing the most uniform drying all over the trays. The trays of this dehydrator are made up of stainless steel which makes it an easy-to-clean appliance. The capacity of the STX-DEH-1200W-XLS is 10 trays as well as the space of 16 square feet. In addition to this, it has three drawer spaces which can be utilized for additional drying. The baking mats made up of silicon can survive the temperature of around 500 Fahrenheit. This makes it very easy to transfer the foods directly into the oven for extra heating. A dripping tray is also provided along with the appliance for catching the exuded liquids. This helps in keeping the interior of the commercial food dehydrator remains clean. The surface of the drip tray is also very easy to clean. The capacity of this appliance is quite enough to handle the large size families. 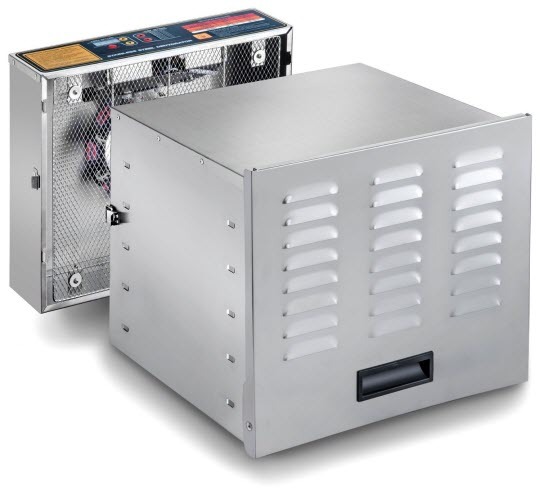 The design of this commercial food dehydrator is made up of stainless steel along with the easy to clean parts that make this appliance rugged, beautiful, and stress-free to maintain. If you do not want to use this appliance then it can be easily reassembled or disassemble. Thus you must have not any issue placing it in a storeroom or closet till you required it. This food dehydrator is essentially larger and less costly than the other similar commercial level food dehydrators. Unluckily the design of this appliance is square instead of rounding which results in the more additional weight. The ends are be sharped which can cause scratches or cuts as soon as they converted into uneven or burred surface. The noise of this product is also little loud which is quite common in the food dehydrators which runs along with the heaters and fans. Due to its larger size also, you can expect more noise. There have been some reliability issues in this appliance as it may show sometimes the inaccurate temperatures or irregular heat. But you can contact the manufacturer in such case as they offer the outstanding support. 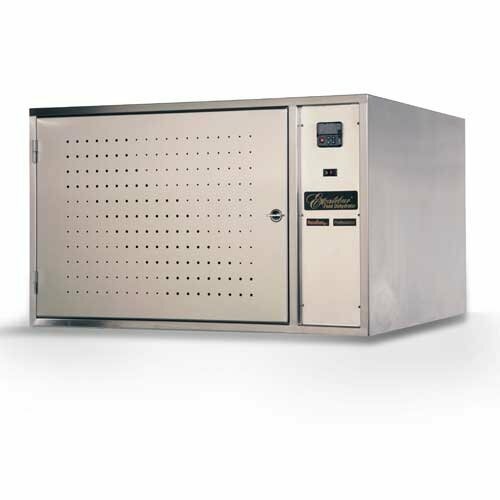 ​There are five stainless steel shelves in this commercial food dehydrator along with the stainless steel frame. There is an 800-watt power capacity along with a fan which offers uniform horizontal air flow in the appliance. The adjustable thermostat temperature of this product ranges between from 90 degrees F to 165 degrees F.
The fan, as well as the motor assembly, can be simply detached for the cleaning purposes. You can also remove the shelf brackets in addition to the shelves for cleaning. The dimensions of this appliance are 18.75 x 16.5 x 9 inches. There is a hole in the entrance so that a thermometer can be used to check the temperature of the appliance. There is a 12-hour switch off timer is also given for more assistance to the user who has hectic schedule. This is a decent looking appliance having the commercial kitchen designing. It is made up of stainless steel material which is sturdy and hygienic. The shelves, fan and the brackets of this commercial food dehydrator can be removed can be removed for the stress-free cleaning process. There is one inbuilt switch off timer is provided for more support. This appliance does not offer the accessories such as leather trays or mesh screens. It is little expensive as compared to the capacity it offered. ​The whole back-to-front cabinet is built totally from the high-quality stainless steel. Due to the high wattage power, this food dehydrator can be used for the commercial purposes. It originates with the 12 stainless steel trays which offer you a comparatively large space than any other model of food dehydrators. Along with the trays, you also get the 12 mesh screens. The information display for the Celsius and Fahrenheit is also given as an extra feature. The automatic switch off along with the modifiable alarm and fan is also provided in this appliance. The name of the brand is one of the key factors which compel the clients to purchase Excalibur Commercial Food Dehydrator. The sturdiness, consistency as well as technology of the Excalibur EXCCOMM1 NSF dehydrator makes it useful to buy. The price of this appliance is quite affordable than the other commercial food dehydrators which are available in the market. Twelve trays offer additional capacity but it does not affect the overall size of the unit. It needs very less space on the countertop of your kitchen. The supplementary thermostat has extensive temperature array. Thus, drying out an extensive range of food is easily possible in the Excalibur EXCCOMM1. This product is rigorously following all the NSF specifications. This product is not appropriate for a big size restaurant or similar business. Since it cannot be expanded more than twelve trays then it might not be adequate to the necessity of the large scale food business. If you willing to utilize it for a household purpose then you can use it for big size families. It is not perfect for the individual person or small size families having few members. It demands bulk usage. The price of the appliance is also quite high if you are buying it for the household purposes. ​The product of the appliance is only 6.5 lbs which make it a lightweight product. It possesses a maximum range of temperature i.e. 180 degrees Fahrenheit. This product has the built-in simple one-step functioning button which makes it stress-free to run. This product is affordable due to its low price rate. You can easily operate this appliance without any guidance. Owing to the smaller size of NutriChef Kitchen commercial food Dehydrator, you need very less counter space in your kitchen for placing it. Due to the presence of clear trays, you can easily monitor them at all levels. 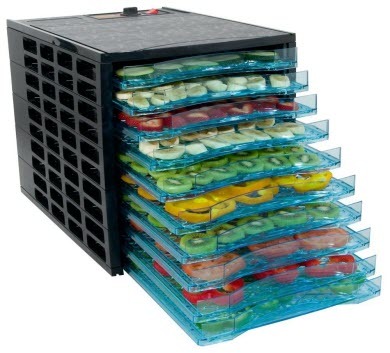 The 20 stacked trays offer a large capacity for drying out the food. There is no temperature control provided in this appliance. You will also not get any timer in the NutriChef Kitchen commercial food Dehydrator. The trays also required rotation since the bottom dries out little faster. In fact, the trays of this food dehydrator are not even dishwasher safe so you have to clean them with your hands. 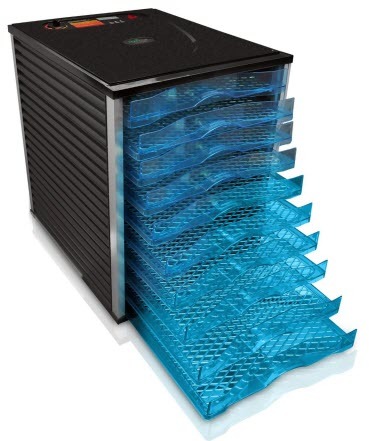 ​This is a powerful and extra- big commercial food dehydrator. There is around 16 Square Feet of space for drying long with the ten drying shelves. A 12 hours timer control is also given control. The range of temperature of WYZworks Commercial Food Dehydrator range is between 95 Degrees F to 155 Degrees F.
There is an elevated and takeoff front door for locking during the functioning of the appliance. For the horizontal air flow system, a 7-inch fan is given which produces consistent dehydrating heat all over the drying area. The quality of the product is guaranteed by the CE and ETL certificate. The drying shelves of the appliance are made up of safe stainless steel material which as per the Safety Standards of the United States USDA. Due to the stainless steel material this product can offer you its service for the longer time period. This appliance is quite convenient to use. The ratio of quality-to-price is also very good. After buying this product, you will realize its worth as per its price. The timer given in the product does not function properly and it often fails to work adequately. The price of the product might be high for some people. Q: Can I get a drip pan along with the commercial food? I think you are a new user of this appliance. For your information, the accessories are not provided along with the dehydrator. If a person needs them, then he/she have to buy it additionally from the market. ​Q: I am a new user of the commercial food dehydrator. Please let me know that what wattage capacity appliance I should buy? ​Q: For what purposes a commercial food dehydrator is used? ​Q: Does the commercial food dehydrator consume more energy a than the ordinary food dehydrator? ​Q: Does the commercial food dehydrator similar to the ordinary food dehydrator? Yes, both food dehydrators have the similar functioning process and they both offer the delicious and healthy dried food items to the user. The only difference between the two is the size and the power. Commercial food dehydrators are designed in such a way that it can be used in places like restaurants, hotels, etc but regular food dehydrator﻿﻿ is meant for the household uses. ​Q: Will I get the shut-off timer in such appliances? Yes, you will get the shut-off timer in the appliance if it is mentioned in the product's specifications over the shopping website. ​Q: Does all the commercial food dehydrators are approved by the UL, CSA, and NSF? ​Q: Does such food dehydrators consisted of the plastic parts or the stainless ones? ​Q: Is there any specific temperature range which a commercial food dehydrator must possess? ​Q: Can I replace the racks or shelves of my appliance? ​Q: I think the commercial food dehydrator is very warm for drying out the delicate food items like herbs or spices. Does it so? Q: I have a small family of three members. Can I Buy a commercial food dehydrator for us? ​Q: How many types of commercial food dehydrators that are available in the market? ​Q: I want to dry out two different types of foods in a commercial food dehydrator. Will that be possible in this appliance? 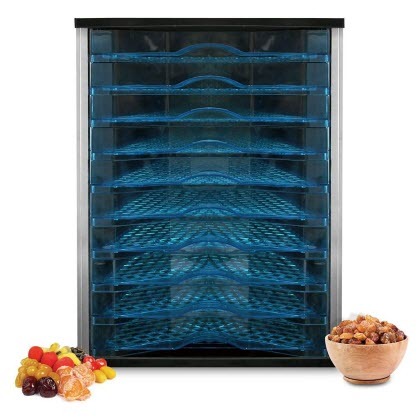 ​Q: Are the commercial food dehydrators costly than the ordinary food dehydrators? A commercial food dehydrator is definitely originated as a blessing for the businesses related to the food industry. It is also great for the people who like to visit the restaurants for grabbing some delicious and healthy foodstuffs. ​These appliances are available in all sizes as per your requirement. You just have to decide that which model suits you the best. We are sure that once you buy this amazing appliance for your business or for big size family, you will undeniably get mesmerized with its outcomes. ​As you know people have become more health conscious nowadays and they want to consume only healthy foodstuffs even when outside their homes. There are numerous restaurateurs who have expanded their business with these remarkable appliances and now it’s your turn! ​All the above reviews of the best commercial food dehydrators will help you in taking a wise decision regarding the purchase. ​We will be very happy if you share your helpful thoughts along with the comments here! Please let us know that whether these Commercial Dehydrator Reviews useful to you?